Systec's Side Pivot Conveyor (SPC) can be used at various points within the overall conveyor system. The SPC is primarily used where change in load direction is required, yet the load orientation must remain the same. This is particularly applicable where pallets may be used within the system. This is due to the fact pallets runners, or bottom boards, must remain perpendicular to the load carrying rollers to smoothly convey the load. Applicable at points within a conveyor line where pivoting around an obstacle, such as a building column, is required. Can also be used at a location where a break in the line may be required for equipment, such as a fork lift, to gain access to an area inside the conveyor system. Provided with a floor mounted mast assembly with power disconnect switches and, an audible and strobe light warning system for impending conveyor movement. 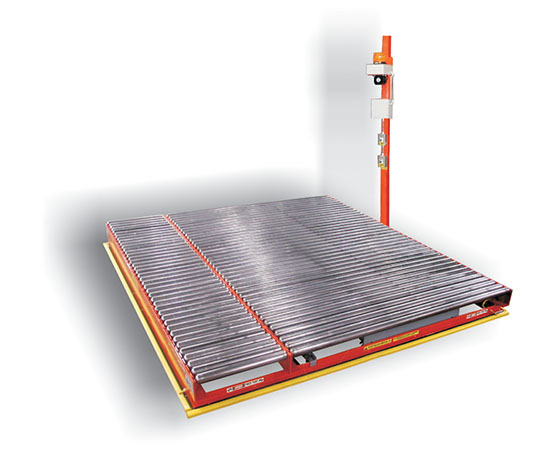 Provides the necessary power for the conveyor and pivoting movement.